The Oceti Sakowin camp has been cleared by heavily militarized police, but what happened there this past year is forever. WE THE PEOPLE showed up in the thousands to protect our water and support the Standing Rock Sioux Nation in their fight against big oil. I am so very proud and grateful to all whom contributed in any way to resist the hateful and greedy monsters behind the pipeline – including #45, who received $100,000 in campaign donations from the DAPL conglomerate. I envied those who were able to go there and represent. But I believe everyone who felt strongly about the cause has directly impacted it as well – including those who prayed and helped keep the story relevant. Bless all of you for standing up for what really matters for our future generations. Living in Rezberry I have well water and I didn’t like it at first because it smelled funny. I was used to city water, which is treated with who knows what…yet now I am very conscious of every precious drop that comes out of the faucets and I am thankful for it. However, I am keenly aware of the fact there are many pipelines that run underneath this land and I get all anxious and mad. Not for my ole carcass but for all humanity in this insane world we live in now. Keep in mind that the dirty, tar sands oil will not benefit Americans at all for cheaper gas prices. It will come from Canada through multiple states and then be sold to China, which has mass pollution. Will we be the next to have to wear surgical masks outside? Oklahoma is now the earthquake epicenter because of fracking, which has clearly been identified as the cause. The good news is that more people are waking to the ugly truth; that we are being sacrificed so the 2% can continue their luxurious lives. Just last month NASA identified planets similar to Earth in orbit around a star outside our galaxy that may support life. Soooo….my question is ‘do the 2% know something we don’t about lifting off to another Earth-like terrain’? I remember a movie like that. Hey, I’m all good with getting rid of those evil viruses but we cannot let them leave us with the mess they left Our Mother in. Oh no! They have a lot to answer for and I volunteer to crack the whip on those over-privileged, whiny babies on clean-up duties. (Not a slur on babies). I’ve been severely depressed for way too long and the situation we Americans are experiencing now due to Pootin’ and his puppet #45 threw me down in a way I wasn’t prepared for. I am, however, becoming hopeful with the recent pushback by American citizens who are refusing to put up with this Pootin’ Puppet President – who has clearly been appointed into office as was W Bush by the SCOTUS. I almost wrote something else. Ahem! On the home front I’m happy to report I have plenty (as of this writing) of toilet paper, cat litter and mac & cheese. Life is good. I miss my son and granddaughters and I pray I get to see them soon. I made my Gramma Rose some short ribs in the slow cooker; I will see her and I am bringing a pie, too. I’m also gonna go play penny poker with my friends and take their money like last time, then go to the casino and double it ;). My favorite TV channel is VICELAND and I encourage ya’ll to watch it if you can. Wake up! Spirits, our ancestors, are with us in this most critical of times. The elites are counting on us to just lay down, but that’s not happened, nor ever it will. My dear friend Diane E., whom I only know from facebook (for now), wrote something that resonates with me and I feel better for it in our mutual disgust of U.S. politics; all we have is each other. I take heart from her statement in that WE, the collective WE, have the power. 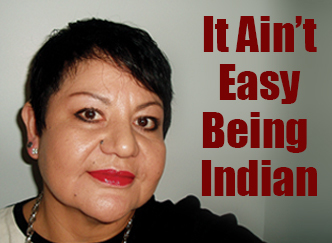 How else have WE Indigenous Peoples of Turtle Island survived complete genocide thus far? My belief is that we possess a priceless treasure, and those who don’t have it envy us. And what is that? Spirituality. That is why they have to kill us. I miss you John Trudell. Just an FYI? WE don’t hate, WE relate. Every human breathing air right now has suffered abuse in their life no matter our skin color or ‘class’. It is what it is but that does not mean the cycle of abuse, hate and every vile, horrific act has to continue. Keep in your hearts that WE have each other. (Insert Bob Marley song here.) I love yooz.